The Carhartt WP Waterproof Insulated Work Glove is quite a mouthful of a name but at first glance it appears to be incredible value for money. The Work Gloves are available in two different colors, black and brown/black. The plain black is your classic glove look in my opinion but the brown/ black looks pretty nice if you’re looking for something that isn’t just plain black. The gloves look really good while also maintaining practicality and so they’re sure to make a good first impression on anyone. These were debatably made with comfort in mind. The ultra soft insulation that Carhartt has decided to use in the gloves works so well. In addition to this the gloves are very true to size meaning you can be confident that the glove will both feel really nice to wear and fit perfectly. Have a look at our sizing guide for more info on sizing. Although I prefer an elasticated wrist cuff the strap does keep the glove firmly in place on the wrist. For a glove in the low price bracket of the Carhartt Work Glove the comfort is very impressive. The Work Gloves are warm but perhaps not as warm as you’d hope. In relatively mild conditions they are perfect and keep your hands at just the right temperature but once the temperature drops significantly below 0 Celsius and if there’s a little bit of wind then these will not keep you that warm. The wind goes straight through the gloves which just isn’t good enough. But as I said if there’s little wind and it’s not that cold the gloves are perfect. Therefore these are not a glove designed with extreme weather in mind. They make up for their lack of warmth with their waterproof properties. The waterproof properties of the gloves are incredible. I used them in what I’d describe as torrential rain and my hands remained both dry and comfortable. In addition to this the waterproofing doesn’t cause the gloves to become too warm as they’re highly breathable, I was pleasantly surprised at this as from experience a cheaper glove can often lack the ability to breathe. When taking the price of the glove into account, Carhartt deserves ultimate respect for what they have created with respect to the waterproofing of the glove. The Dri-Maxwaterproof insert that they have implemented works incredibly well. Carhartt has kitted out the Work Gloves with a reinforced polyurethane palm grip making the gloves perfect for their intended purpose, work. The grip is definitely also good enough for something like skiing or cycling however the lack of wind proofing would put me off using them in this way. In addition to this the W.P. work gloves are fairly bulky so if you’re looking for something to use when you’ll need maximum dexterity than this might not be the glove for you. I used my gloves for moving things around in the yard on a cold rainy day and they were perfect for this. The grip allowed me to put total confidence in my grip on materials as well as keeping my hands perfectly dry, although as previously mentioned I was a little disappointed with the heat retention. Carhartt has created a Work Glove that for it’s cost isn’t bad value for money. But if you’re looking for an extreme weather glove, then this probably isn’t for you. The glove just isn’t warm enough to be worn for extended periods of time in very cold temperatures. The lack of wind proofing doesn’t help this either. However it’s important to remember that this is a low cost glove and the intended purpose is work so they offer really good protection, grip and durability which is the most important thing. Most regular winter gloves wouldn’t hold up to the use of things like power tools and a heavy duty work load for hours on end but these ones with absolutely be fine in those circumstances. 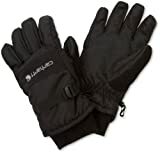 They also have very good waterproofing and a solid grip on the palm making it perfect for working outdoors in more mild to cold temperatures. Taking this into account the glove aren’t perfect, but they’re good value for money. If what you’re looking for in a glove is perfect waterproofing, comfort, durability and protection at a low price the Carhartt insulated work gloves are something you should definitely consider.